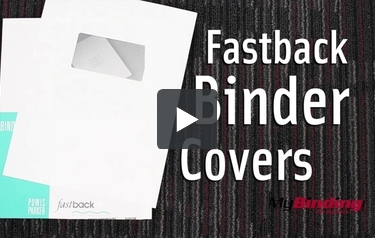 These Fastback 8.5" x 11" Binder Covers Without Windows are designed for use with the best-selling Fastback Super Strips. These letter size Fastback covers coordinate perfectly with the strips, giving your documents a polished final result. Transcript: Okay, these are Fastback Binder Covers! If by chance you get the windowed ones, the package comes with both the front windowed covers and a full back sheet. The question with these covers is, will they better match with my binding strips? Looking at them side by side, you’ll see the color is pretty much the same, but the texture is still different. You can better see the texture when I darken every up. Now compared to a standard linen cover, the color is not quite as similar—and again I’ll darken everything to see the texture. Okay, these are Fastback Binder Covers! Standard grain covers also have the same slight difference in color, but you’ll see that the texture is much more similar to the fastback covers. I’m just going to cut to the chase now—if you want covers that will best match the color of your fastback strips then get fastback covers. But if the you’re okay with the potential of slight color differences, then we recommend getting a standard linen or grain cover because they are cheaper and more accessible. Or look into heat resistant clear covers! Is it possible to add a company logo to the Fastback binder covers w/o windows? If so, do the backages come with back pages too? Thank you! Thank you for your question. We are able to have custom covers made for you with your logo. Please give our customer service department a call at 1-800-944-4573 and we can discuss the options and get the process started.